Best Memory Foam Mattress Reviews. Space Age Sleep Support. Memory foam is now the preferred bed of the average American consumer. While it was cost-prohibitive for most people until just a few years ago, it’s become much more affordable. That’s because there are dozens of factory direct brands that make high-quality products for a fraction of the big box store brand prices! This is why we have decided to find the best-rated memory foam mattresses and review it here. So, why buy a memory foam? What's so special about it? First things first, we gotta talk about where and why it all started. And, by reading this review page about the best memory foam mattresses, we will educate you why it got started and why it will benefit your health in the long term. There are so many things that people do not know about this individual product, but we are here to enlighten you and help you decided if you do need it in your life or if you're better off buying something else. So, let's get started with the information! The material was first developed by NASA in the 60s, like so many other things (Velcro, etc.) but was not used to make memory foam mattresses until the 90s. Since then, best rated memory foam beds have helped many people get back to having a good night’s sleep. These are designed to form to a person’s shape. Unlike a traditional spring model, they’re not a static surface. By forming itself to the person’s body, this special material offers total, personalized body support. It alleviates body pain and pressure points very effectively. However, not all memory foam mattress models are created equal! Many off-brand versions are built shoddily, or engineered without a lot of thought as to the needs of the average sleeper. With so many top rated options available online, it’s easy to be overwhelmed by the shopping process. This is why we have reviewed all these products today. We’ve done the research to help you out! We put this review guide together to show you three of our favorite best-rated models on the market today. We’ve chosen a few of the top options to suit different needs, tastes, and budgets. The Sleep Innovations SureTemp is a thick, sturdy mattress which offers superior support and pressure point relief to reduce tossing and turning. This one also eliminates motion transfer and conforms to the body to ensure proper spine alignment. 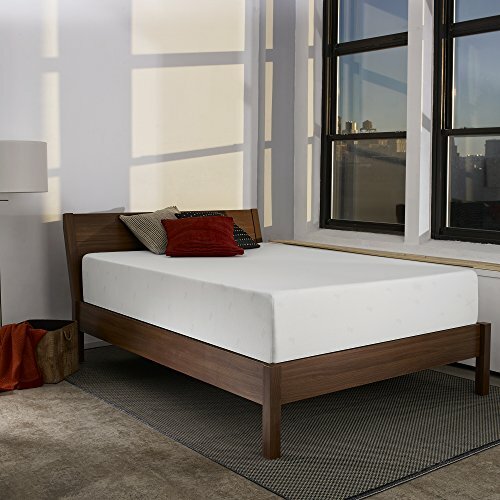 It consists of a 2.5-inch luxurious layer of Sleep Innovations SureTemp™ Memory Foam on a 9.5-inch base of memory foam. It is rated at a solid medium feel (in-between medium-soft and medium-firm). We’d recommend it to people who want a firmer sleep experience than the DreamFoam. So, keep reading our review to find out more about why we think that this is the best budget memory foam mattress. It’s a firmer bed, so it’s the best choice for people who like more support than cushion in their bed. The Sleep Innovations SureTemp has a shallower memory foam layer on the top, so you won’t feel like you’re sinking into this one. If you’re a back sleeper, it’s important to have that firm support. It’ll keep your lower back from curving too much overnight, which can be a primary cause of pain. With that said, there’s enough cushion to relieve pressure points. Sleep Innovations have designed this one to give enough relief to the average body at the hips and shoulders, as well as neck. There’s a 2.5″ comfort layer on the top of the bed, which will conform to and cradle your body. It isolates motion pretty well. As with the DreamFoam, the sheer depth of the Sleep Innovations SureTemp really helps in this department. It’s a good choice for couples. It’s the sturdiest of our recommendations. This one has a 9.5″ support block of structural cushion, which is the thickest we’ve looked at here. Sleep Innovations recommend it for average to bigger bodies. We’d especially recommend this one for heavier people who sleep on their back. The sturdy base also helps this one hold up under the weight of two sleepers on a regular basis. It’s more affordable than the DreamFoam, but offers a bit better durability and quality control overall. We didn’t find many buyer reviews of any soft spots or dips developing over time. It’s all made here in the USA and backed by a 20-year warranty. We think that’s especially impressive at this price-point. Some previous buyers found that this one held too much heat for their comfort. While the Sleep Innovations SureTemp material is more effective at mitigating heat than some older memory foams, we really wouldn’t compare it to gel padding or air channels. If you sleep warm, we’d recommend the New Cool Breeze, which has a similar feel. It’s on the firmer side. This one has about half the cushion of the DreamFoam, so people who are expecting their bed to really shape around them and cradle more deeply might want to look elsewhere. Previous buyers noticed that this one is definitely on the heavy end of the spectrum. That’s because of the dense support cushion base. You might want help unpacking this. There were a few quality control issues reported and reviewed online. We found a few isolated buyers who said that there mattresses didn’t fully unroll, so they ended up with wonky, slightly-bent beds. That should be covered by the warranty/return period, but getting the full thing out the door could be a hassle. Our top quality pick in the memory foam category is this Dream Foam Ultimate Dreams memory foam mattress. It’s a deluxe 13 inches thick, with three different padding layers working together to give you a premium sleep experience. We love the USA build quality as well as the thick gel upper layer, which keeps you fresh while still molding to your body. 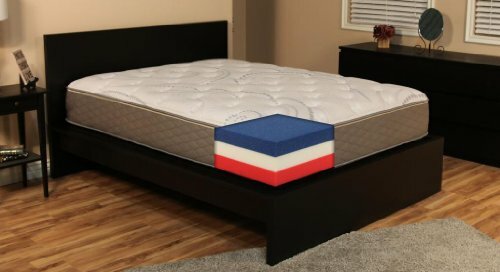 So, if you want to learn more about this product then keep reading our Dream Foam Mattress review right here. It’s both comfortable and supportive. The Dream Foam Ultimate Dreams is a deeper model than the New Cool Breeze, and that means there’s more room for cushion and structure without compromising one or the other. On the top, there are a very generous 5 inches of memory foam, which conforms to your body, relieving pressure points and alleviating back pains. Under the surface, there are a solid 8″ of support padding. That keeps you from sinking too far into the bed. The solid support base and thick comfort layer make this one a particularly good choice for heavier people and side sleepers. It’s also a smart buy for individuals who want a plusher, more “deluxe” feeling bed. It isolates movement very well. That’s one advantage of a thick bed like this one. It’s also a result of the thick surface layers of memory foam, which help keep any surface changes close to the sleeper. We’d recommend it to people who sleep with a partner, especially if you continue slightly different sleep schedules and want to avoid waking each other up. It has smart cooling features. 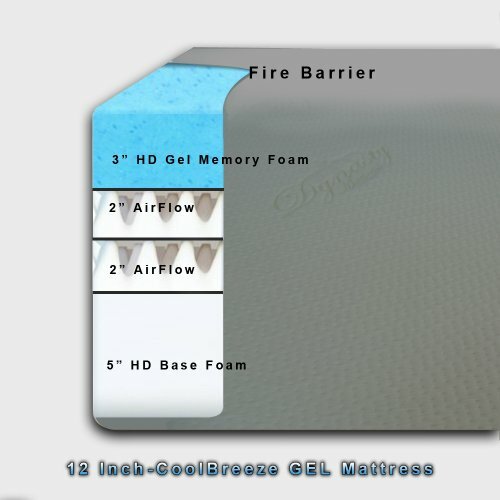 The first 3″ of the Dream Foam Ultimate Dreams memory foam on the surface have gel infused into the material. This helps disperse heat away from your body cavity. It’s a similar feature to the New Cool Breeze, and the layer is even deeper here. It’s built completely in the USA. All of the cushion components are Certi-Pur certified to have lower emissions from off-gassing. The manufacturer also ships directly from the factory, so the mattresses are wrapped for far less time than some of the competition. So, you’ll have less of a smelly situation when you open the box. Given that domestic quality level, it’s relatively affordable. Even the largest sizes cost well under $1000, where big box store brands that manufacture in China can run over $2-3000. Many people found that the chemical smell persisted longer than the two days airing out period. The consensus, however, was that the smell dissipated over about two weeks, so there is a level of patience (or extra time) you need to fully enjoy this one. Pro-tip: unwrap the bed in the morning before you leave for work, and crank a fan in a window while you’re gone. That’ll get the worst out of the way in a hurry! It’s not quite as cool as the Dynasty Mattress. That’s probably because there aren’t air channels built into the support cushion. However, it’s still a good deal cooler than non-gel traditional cushion models. So, there is it, our Dream Foam Mattress review. We hope that you've enjoyed reading our full review. 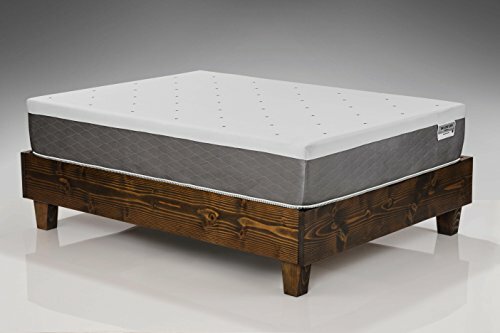 The Dynasty New Cool Breeze Memory Foam Mattress is one of our favorite modern beds. It has lots of smart features to compensate for many of the issues with older models. There are gel beads and an air channel system built into the cushion, which works together to keep you cool at night without sacrificing any comfort or cushion. So, if you are looking for top-rated mattresses then you don't have to look too far as all that you need from these products are in the Dynasty models. It provides an excellent comfort level for most sleepers. The Dynasty New Cool Breeze Memory Foam Mattress has four separate layers to provide a balance between cushion and support. The top layer is 3 inches of gel-infused memory foam. It shapes itself to your body, providing you with a soft, supple surface. Underneath, there are two separate layers of comfort cushion, at 2″ each. They’re designed to relieve pressure points in your body, like the hips and shoulders. At the bottom, there’s a 5″ block of high-density support padding. It provides structure to the whole bed and keeps you from sinking too far into the bed. Based on our Dynasty Mattress review, many previous buyers found it to be the exact firmness that they were looking for. They found that once they had slept a few nights on the Dynasty Cool Breeze, their back and neck pain had decreased or was eliminated. The thick cushion and custom fit help you sink into one position comfortably, which you’ll notice because it cuts down on overnight tossing and turning. It keeps you cool. The top layer is infused with gel beads, which help disperse heat away from your body. With many older models, heat is trapped in the pockets around your body. The middle two layers both have air channels cut into them, to help keep circulation at night. This keeps the core of the mattress cool and airy. ​It’s easy to stay clean and healthy. The New Cool Breeze comes with a full cover, which is designed to keep dust mites and other allergens out. One other benefit of memory foam is that it’s inhospitable to those microscopic creepy-crawlies, so you never have to worry about building up a population in your bed. That’s a big step up over traditional spring mattresses, which are notorious for building up bugs over the years. ​It’s available in nearly any size imaginable. While many other models have just 3 or 4 options, this one is available in sizes ranging from twin to California king with XL twin and XL full. Some previous buyers said that the New Dynasty Cool Breeze wasn’t quite as soft as they expected. While this is a thicker mattress, it’s not necessarily plusher. This one is sold as a medium firm memory foam option — so if you’re looking specifically for a softer one, this might not be the right choice for you. That said, many customers found the firmness helped them get a better night’s rest and gave better support. As with any new one, there is an airing out period — but a few customers found that the Dynasty Cool Breeze memory foam mattress continued to off-gas fumes even after the recommended airing period. We’d recommend getting a fan involved for the first night or two, to speed up the off-gassing process. So, which of these products is the best choice for you? What is the best memory foam mattress brand today? All these questions will be answered by us, so you don't have to worry one bit. The New Cool Breeze is the best bet for buyers on a budget, as well as people who sleep warm. It’s the least expensive of our reviewed products, and it’s full of smart features to dissipate heat and keep you cool all night. However, it’s not as thick or as plush as the DreamFoam. It’s a better choice for people who like a medium feel mattress. The Sleep Innovations is the best choice for people who like something on the firmer side based on our review. The sturdy base makes it a durable bed and also helps accommodate heavier sleepers. However, the more shallow comfort layer means it’s not the best choice for side sleepers. For people who like a firm, sturdy bed, it’s a reliable choice that you won’t have to buy again for years. The Dreamfoam is our top quality recommendation for people who want the full memory foam experience, without cutting any corners. It combines a solid base with a thick, comfy upper layer. It’ll conform to your body and relieve pressure, while still keeping you from sinking too far into the bed. While it’s the most expensive of our reviews, it’s made in the USA and gives you a lot of bang for your buck. Looking for more super comfortable memory foam mattresses? Check out the reviews of the best sellers on Amazon! Also, we have done reviews on other types of beds as well so you guys are free to check it out. Just go to the top menu on this page and you'll find the other products that we have tested. We hope that you've enjoyed reading our review on this particular type of bed. Happy sleeping!